I’ve always loved the creamy, spicy and tangy taste of curry recipes. And overtime I have a chance to try a new version, I jump on it! However of my good ol’ reliable standby curry recipes that I make frequently at home is this Thai Shrimp Curry Recipe. You can find the coconut milk, fish sauce and curry paste in the Asian section at the grocery store (Thai Kitchen is the brand I used, and it’s pretty readily available at most stores). I also love to bulk this dish up with vegetables such as carrots, red bell peppers, zucchini and tomatoes…yum! The flavor and heat is in the curry paste, so add more or less to suit your taste. I also like mine tangy, so I often add extra lime juice. Feel free to play around with yours until you achieve the perfect flavor that suits your mood. 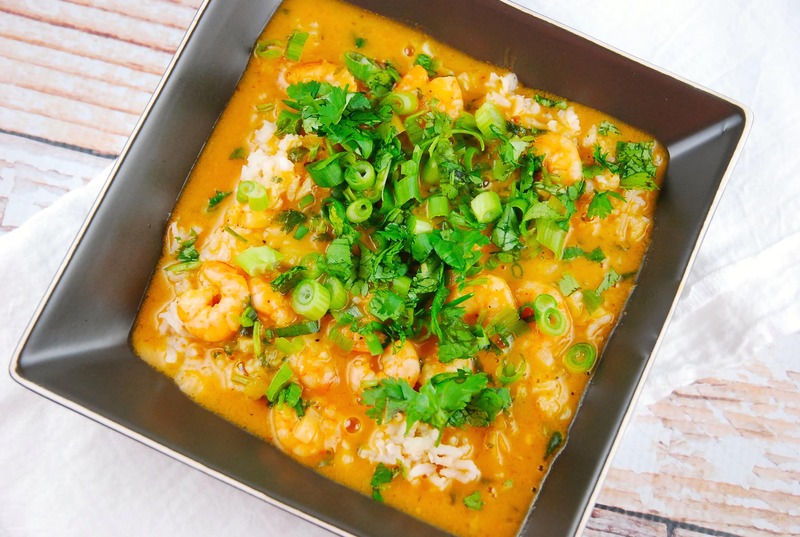 At just 7 Points per serving, this Thai Shrimp Curry Recipe is way healthier than most restaurant versions. Enjoy! Spicy, tangy and slightly sweet, this creamy coconut curry will melt in your mouth. Simple, yet incredibly flavorful, it’s quite healthy and makes a wonderful Weight Watchers dinner recipe idea for a busy weeknight. Prepare rice according to package instructions and set aside. Heat oil in a large skillet or wok over medium high heat. Add in the white parts of the scallions and the garlic, and sauté until fragrant, about 1-2 minutes. Add in the curry paste and honey, and cook for another 30 seconds to 1 minute. Now stir in the fish sauce, coconut milk and lime juice. Bring to a boil, then simmer for about 2-3 minutes, or until the sauce has thickened. Add in shrimp, and cook while stirring, until shrimp is pink and cooked through, about 3 minutes. Remove from heat, and stir in cilantro and green parts of scallions. Serve over brown rice. We enjoyed this meal, especially my husband who loves shrimp. Next time I would add more red chili paste and maybe siraccha to push the heat a bit. I added pineapple, bell peppers and water chestnuts which is what I had on hand. It just bulks up the dish for no points. LaaLoosh never fails me. I love this site. I made this recipe for dinner last night….I’m not sure what I think yet but my husband loved it. The taste was fine, but the smell was pretty gross when it was cooking. I added peppers to it to give it a bit more nutritional value so perhaps that was the downfall. We made this for dinner last night, great for my wife who is on Weight Watchers. I too would add a little more red curry paste to give it a little more heat. I had troubles getting the sauce to thicken and had to add a little corn starch/water mixture to get it to the right consistency. Next time we may add some additional veggies to amp up the volume. (ex. pea pods, mixed peppers, water chestnuts, slivered carrots) We felt the flavor was fabulous for the simplicity of the recipe. Will add to our dinner line up! This looks delicious! How much rice and how much sauce did you serve to equal the 7 points? This was delicious. I would probably add a little more red thai curry paste. I do have a question though – The recipe says 7 points for 1 1/4 cups. Is this for the sauce only and should the rice be counted for extra points? The Points Plus include the rice. Yay! Just hAd this for dinner tonight! So so so so delicious!! !